How many actions demonstrated in our physical world are the result of guilt? Guilt is acted out every instant of every day. Shame, anger, blame, grudges, belittling, punishment, violence, anxiety, reactiveness, and on and on and on. There are many effects of guilt and some of these effects are acted out on others and some are put on the self. If we see where we behave like this in our own lives we may recognize that there is a lot of guilt being thrown around! So, why do we feel guilty? A Course in Miracles teaches that it is because we feel that we separated ourselves from the Source of Love. And in so doing, we feel horribly guilty about it. “What do I have to feel guilty about?” is a common question I hear from my clients, so if this also seems foreign to you and you are genuinely questioning whether this is relevant for you then try this… observe how you feel when a cop car pulls up behind you. You know that your insurance and registration is up to date, you know that you’ve been going the speed limit and have been signaling correctly, so what’s with the guilty feeling and defensiveness? The cop doesn’t even have their sirens on and yet you’re busy making sure all your ducks are in a row. We play out this dynamic in so many ways. Think about whenever someone is upset with you and they let you know as much. The common reaction is to justify your actions and establish your own innocence, even if you did something or not. You’re attempting to disown the guilt. You’re disowning it because it feels absolutely horrible to feel guilty! “What was in our mind on a massive metaphysical level – namely the terrible unconscious guilt we felt over the initial separation from our Source – was denied and projected outward. This is the guilty ick of the ego. An ever present feeling that peaks and dips throughout the day. Whenever you’re poked by someone or some situation, the unpleasant feeling which follows is a symbol of the guilt that you identify with. This is truly a gross misidentification. You are not a guilty being deserving of punishment. Quite the opposite! You are perfect love seeking to undo your ego identification! I will put it simply, whenever you feel guilty, you gotta forgive it! Or else it will just circle back. Nothing good ever comes from guilt and this is something that we need to be fully cognizant of. The effects of guilt are always projected outwards and as, A Course in Miracles, states, “without projection there can be no anger.” T.7.VIII.1.1 - So, you want to work within your own mind to make sure that you are not acting out to others your own guilt. In recognizing that you have identified with an unfounded guilt, you can see that you are truly innocent. All the things that you supposedly did wrong were not sins to be punished but mistakes to be corrected. We all make mistakes, forgive it and let it go. Love heals, not punishment, and this is true for everyone. So let your innocence be your guide. This requires a high level of self-awareness especially when conversing with others but it will win out in the end. Love always prevails. 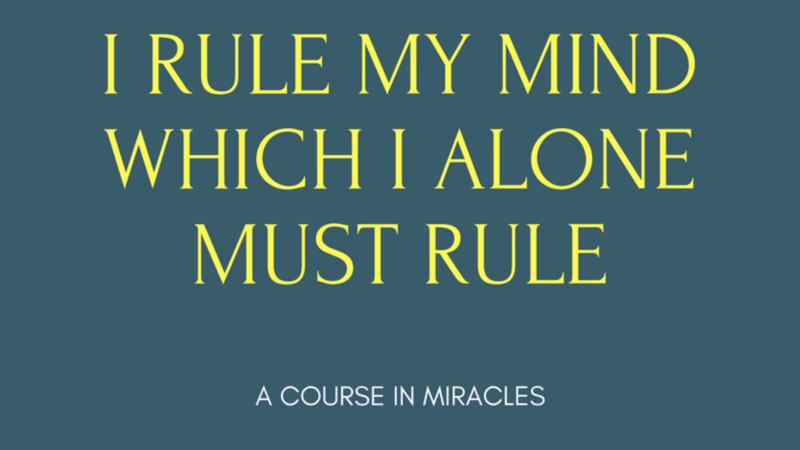 To help you along your path of letting go of guilt, here is my favourite affirmation from The Course. It is the ultimate correction! Remember that you can switch out terms to suit your taste, the important thing is that you recognize that you made a mistake in your thinking and that you want Love to correct that mistake. Simple. This is the most POWERFUL affirmation you can ever make! It undoes the guilt in your mind, corrects any negative repercussions from your mistaken thinking and brings your innocence to the forefront of your mind. Rock this out whenever you feel upset! Once you experience the freeing results for yourself, this affirmation will truly become your best friend. Remember that you are innately innocent and there is a part of your mind that knows this so tap into that loving part of your mind and let it grow strong. You are not the ego nor its convoluted mess of guilt and fear. Let your innocence be your guide. That’s truth.